All Drop Shipped Orders from ROHN Factory are subject to your local and state sales tax. Tower and foundation installations should be performed by qualified and experienced personnel using construction drawings. All types of antenna installations should be thoroughly inspected by qualified personnel and re-marked with appropriate danger and anti-climb labels at least twice a year to ensure safety and proper performance. Wind Loading, Antenna Loading and Wind Survivability ratings vs. Height Documentation Provided by ROHN is available here as a Resource, but is by no means complete by itself or a substitution for Engineering Conducted Specific to your Application. 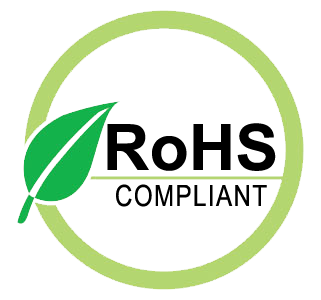 Contact Us with any Questions you may have regarding Use prior to Purchase. All Information regarding the ROHN 25G Tower line, Parts and Accessories is as accurate and complete as we can possibly provide given that this Resource Offering is subject to change without Notice and is beyond Our Control. ROHN G-Series Bracketed towers can be installed adjacent to buildings using a bracket to secure the tower in one or two locations along the height of the structure. 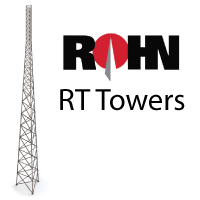 ROHN Bracketed Towers are available in heights from 40' up to 100' for the 25G, 45G and 55G tower models. ROHN Bracketed tower features include: - Completely hot-dip galvanized after fabrication to provide absolute corrosion protection. - Cross bracing fashioned into a Zig-Zag® pattern for strength. - Pre-engineered loading charts to meet varying individual specs and site conditions. - Typical uses include: small dishes, broadband, security and two-way communication. Get all of the benefits of a Self-Supporting ROHN 55G tower, without ever having to climb! With a ROHN 55FK, you can easily access the top mounted components, without ever having to climb the tower. In the time it takes to climb the tower, the top can be lowered down to ground level. Maintenance and replacements can be performed at a comfortable and safe working level in minutes, eliminating the need to work at dangerous heights. When the work is complete, the tower is easily returned to the upright position and locked into place. You never have to leave the ground. ROHN's new design starts with a solid 45GSR base that is hinged at the top. ROHN 55G tower sections provide the mast, extending up to 60'. The design is based on 90mph winds, with no ice, and is available in heights from 20' up to 60'. Available in 20', 30', 40' and 50' heights. 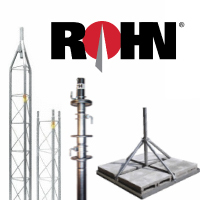 All ROHN Telescoping Masts are pre-galvanized and come assembled with hardware. Erecting the Telescoping Mast is made by simply connecting guys and brackets to the attached unique heavy duty rolled edge guy rings and clamps, extend the sections, insert the locking cotter pins, rotating the tubes to a locked position, and tightening the clamps. The unique ROHN Telescoping Mast design features interior tube flanging combined with a double crimped exterior tube to produce a stronger and more stable joint than most common masts. This exclusive design also prevents the sections from accidentally pulling apart and allows disassembly by pulling each section out through the lower end. Each section extends deeper in to the lower tubes than most other Telescoping Mast designs, adding still further to the stability of the structure. H Series This heavy duty series of Telescoping Masts uses 1-1/4" 16 gauge galvanized tubing for top section. All other sections are 18 gauge. Replacement or repair tower hardware items can be ordered to support tower repairs, upgrades, and collocation projects. ROHN also offers grounding material and prepackaged tower grounding kits, Tower Paint and Piping, and Guy Materials for purchase.